Your head and neck should be lined up with the rest of your spine. This is quite difficult to achieve if you’re using multiple pillows. So sleep with just one pillow beneath your head. Make sure it’s thick enough to provide adequate alignment, but not so thick that it angles your head upward. Also make sure it’s not too thin, otherwise your head will tilt down when you’re lying on your side. I recommend a firm low-loft latex pillow for most patients. These are neutral, affordable, and won’t break down like conventional fibers. 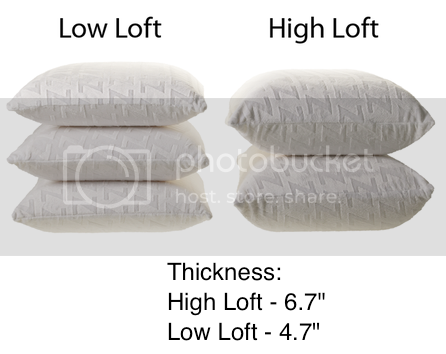 High-loft pillows are tempting, but these are more suitable for people with broad shoulders. Here’s a picture of the difference. An additional body pillow or separate knee pillow is fine to use as well. They’re not essential, but can help prevent you from rolling onto your stomach during the night. Here’s a contoured knee pillow for side sleepers, and here’s a bolstered knee wedge for back sleepers. What Sleep Position is Best? There are essentially three main sleeping positions – side, back, and stomach. While comfort is highly subjective, proper alignment isn’t. The best sleep position is one that promotes a balanced spine. Back and side sleeping can achieve this; stomach sleeping cannot. If you choose to sleep on your stomach, go for it, but you should know that over time this can cause damage to your spine and its supportive structures. Generally speaking, spinal damage can range anywhere from minor/moderate to severe. To avoid mass hysteria, I’m not suggesting that sleep position will cause severe problems like paralysis… But it can compound minor/moderate irritation and pre-existing spinal misalignments into measurable damage over time. I’m referring to things like hyper-mobile joints, muscle spasm, vertebral disc thinning, postural distortion and other arthritic changes. This leads to chronic neck, back, or arm pain that can limit your ability to work and do the things you enjoy… Simple tasks like driving a car, swinging a golf club, and holding your baby can become quite uncomfortable. Here’s how to train yourself to quit. It’s tempting and logical to assume that you can feel the effects of spinal decay. While I wish that were true, it’s not always the case. The process can develop very quietly over 10-20 years (or longer) without any urgent symptoms. By the time a person finally decides to seek treatment, it may be too late. This type of decay is irreversible, so it’s important to take care of your spine while you still have options. Is Your Spine in Shape? Keep in mind that it’s much easier to correct spinal problems when you discover them in your 20’s-30’s than it is when a chiropractor points them out to you in your 50’s-60’s. No matter what you’re doing, the way your head and neck are positioned relative to the rest of your body is important. Society is slowly beginning to realize that it’s not good to have your head hunched forward for hours at a time when working at a desk. Sleeping with your head tilted or twisted all night can be even worse! So don’t forget to practice good pillow posture. Great post! I haven’t tried the latex pillows. May have to check them out. Thanks, doc. Give’m a try, they’re fantastic. I get a lot of positive feedback from patients and readers who use them as well. Great post! One thing I do for my patients is to give them a picture of there cervical spine X-ray so they can view it everyday. This provides a constant reminder that using the correct pillow as well as correct sleeping postion makes a difference long term. I’m so grateful to you for the post.I was troubled with my neckpain for weeks and was looking out for a pain-free and effective method for adapting a correct posture and improve my muscle tone.I like to sleep with comfortable pillows, so I generally use 2-3, but I discovered that, that is the reason for the pain in my neck, so I reduced them to one, it was uncomfortable for few days but there was a quick fall in my neck pain.I use the firm low-loft pillow like the one you recommended. Great post! My warm regards to you. Great post! I think unless I was a patient under chiropractic care, I would have never appreciated the value of posture and even pillow posture.